The annual cake mixing ceremony flagged off at the Rooftop, at Citrus Hotels, amongst much anticipation & cheers, on Monday 23rd November 2015. “No Christmas is complete without the traditional Christmas pudding. Christmas cake mixing in Citrus Hotels is done with a lot of fanfare by our team, who mix, almonds, cashew nuts, dates, candied peel, swiss berry and spices together, and douse it with bottles of wine, rum, and other assorted spirits. However, the treat is not to savour immediately, but to keep ready for the festive season. Cake mixing is done in advance because the fruit needs to be mixed with spirits and spices to achieve the desired flavour”, explains Russell Gregory, GM. A long table was beautifully lined with assorted dry fruits & ingredients of various hues & colors, forming the letters CITRUS. Much to their delight, guests were given aprons, chef hats & gloves and invited to participate in the mixing. 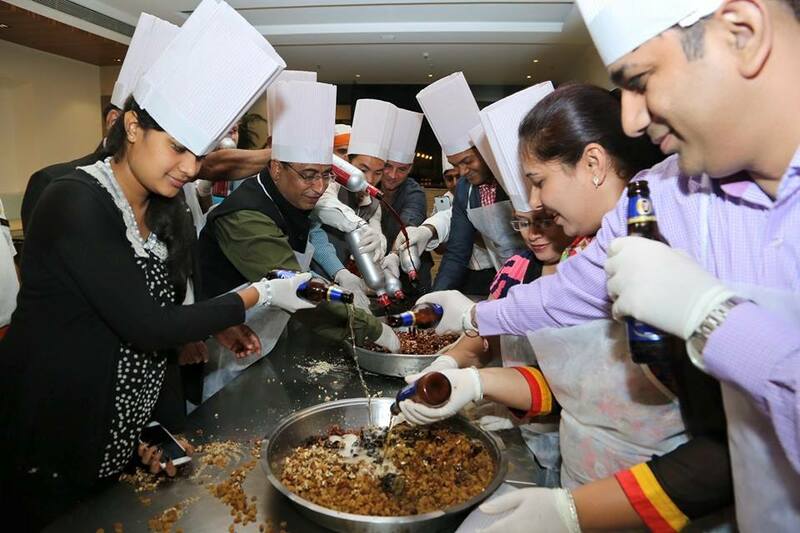 Each guest thoroughly enjoyed themselves mixing the dry fruits with wine and juices and alcohol in the bowl and got down & dirty mixing up the ingredients. “The mix will now be placed in a secure place to soak in all liquid and mature beautifully in time for Christmas and will then be used by the in-house bakery to make plum cakes, puddings etc,” said Chef Vishvesh Khanna. The event saw a mix of room guests, privilege members and media. Guests were served wine accompanied by delectable snacks, followed by a sumptuous dinner. Needless to say, it was an enjoyable ceremony. Next ZOUQ- MOROCCAN FLAVORS IN THE CITY!